Paul recommends a Veritas scraper as the steel takes a good edge, hardness is just right and not too brittle and they flex well. 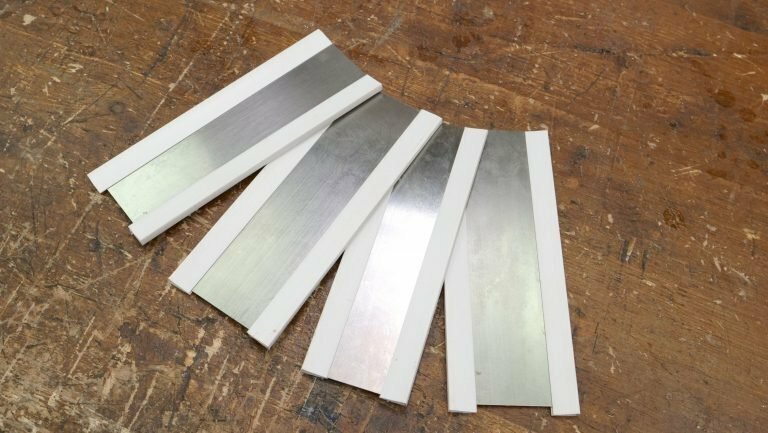 They come in a set of 4 rectangular scrapers (listed as Veritas Super-Hard Milled Scrapers) which contains scrapers of different thicknesses and sizes so will suit a wider range of options for different task possibilities. This also means that when one card scraper gets too hot, you can pick up another and continue instead of waiting for it to cool down. Scrapers are available with a scraper holder, but Paul feels this is an unnecessary step that interrupts the process and makes it take longer. The set should cost no more than £20 new. /We purchased these Veritas Super-Hard Milled Scrapers (x4) from Axminster for £17.10* with £2.95 delivery which are also available to order from the US.